Among more than 400,000 participants who enrolled in the study, only 0.5 percent ever received an atrial fibrillation alert from the app. This weekend, Stanford Medicine researchers presented the long-awaited results of the Apple Heart Study, which explored the performance of the Apple Watch’s heart rate sensor and an accompanying algorithm in detecting potential arrhythmias. Funded by Apple and launched back in 2017, the research project enrolled 419,297 Apple Watch and iPhone owners. Among these users, 2,161 (roughly 0.5 percent) received a notification of an irregular pulse. These alerts occurred less frequently among participants under 40 (0.16 percent alert rate) and most frequently among those older than 65 (greater than 3 percent alert rate), according to the researchers. Approximately 57 percent of all participants who received an alert reported seeking medical attention outside of the study. Should a participant’s heart rates trigger a notification, the Apple Heart Study app would prompt the user to schedule a telemedicine consultation with an American Well provider, who would then determine whether or not to mail BioTelemetry’s seven-day ECG monitoring patch to the participant. These patches were sent to 658 participants, and returned by 450. By comparing simultaneous Apple Watch and ECG patch readings collected from these 450 users, the researchers found a 71 percent positive predictive value (positive tachogram reading) for the algorithm. In 84 percent of these cases, users who received a notification were also experiencing atrial fibrillation at the time of the alert. In addition, 34 percent of participants whose initial notification prompted an ECG patch delivery were later identified with atrial fibrillation. "AFib can come and go, particularly early on in the course of the disease. It's not surprising for it to go undetected in subsequent ECG patch monitoring,” Dr. Mintu Turakhia, an associate professor of cardiovascular medicine at Stanford and the principal investigator presenting the study data at the American College of Cardiology’s annual meeting, said in a statement. “So while only 34 percent of people who were still having AFib on the ambulatory ECG, that doesn't mean that 66 percent didn't have AFib. It just means that AFib may not have been there at the time … These parameters help us understand how we, as clinicians, should think about these notifications." Of note, the Apple Heart Study did not reach its enrollment goals of 500,000 total participants, and 75,000 aged 65 years or older; relied on self-reported user data; and did not include comparison to a control population. However, this isn’t the end-all be-all for Apple Watch heart studies. The University of Michigan announced last week that it would be launching a three-year investigation of the smartwatch’s role in collecting predictive health data. Meanwhile, new info on the multi-year research collaboration between Apple and Johnson & Johnson announced in January is now available courtesy of the project’s website. That study is a pragmatic randomized controlled study design with a 65-and-up participant pool. Researchers plan to open enrollment later this year. 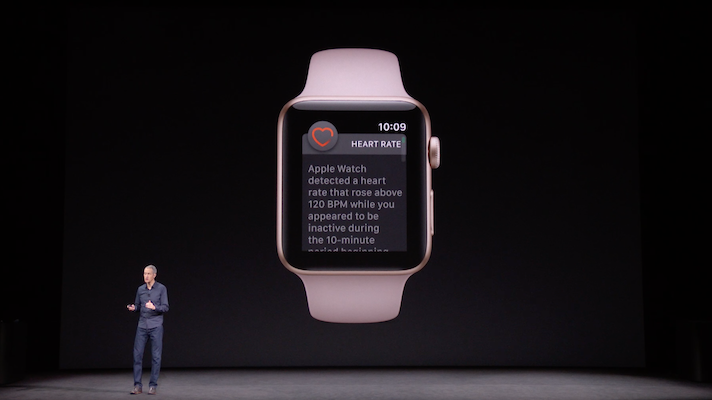 Apple has pegged the Apple Watch’s heart health capabilities and other health data monitoring features as a vital component of its wider digital health strategy. These health screening features have generated heated discussion within the health industry from the get-go, with a heavy focus on whether or not putting such tools in the hands of the average person is such a good idea. Some practitioners have lauded the devices’ potential to increase patient health engagement with their personal health and behaviors (often with some encouragement from Apple itself). Others have worried about false positives, excessive calls to the doctor and — for atrial fibrillation in particular — unnecessary treatment that could actually worsen outcomes. So far, many of these concerns have been driven by anecdotal evidence and limited evidence from Apple and the FDA. The availability of concrete data on key points of contention such as alert rates, positive predictive values and healthcare engagement rates, as well as further data to come, can help better inform the ongoing debate. Alongside its heart rate monitoring, Apple’s latest wearable was updated just a few months ago with an onboard ECG feature and algorithm. In addition, the company has been cutting deals with payers that would allow wellness program participants to earn their device through regular physical activity. CNBC also reported earlier this year that the company has been eying private Medicare plans as a potential market for its smartwatch. And although Apple has lately been making the most noise on mobile atrial fibrillation detection, it’s certainly not the only device out there — AliveCor’s KardiaBand has been reporting strong data for some time now, while an NHS investigation of its KardiaMobile device just recently found the mobile tool to be five times more effective than current tests used to diagnose heart rhythm problems.